Today has been one of those great girlfriends days. I went and had lunch with these three today. 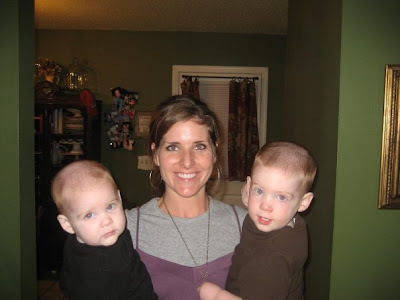 This is my friend Rachel and her little boys Judd and Brody. She had me over to her house and fixed me probably the best lunch I have had in years. The BEST chicken salad on a croissant and DIRT CAKE! Can I say yum? And the best part - they are leaving town tomorrow so she sent me home with containers of the chicken salad and the dirt cake. It's the gift that keeps on giving. We just sat and visited and her little Judd really latched on to me which I LOVED. He kept saying "Kelly - come here" and he would hold my hand and take me places or just sit in my lap. So fun! If you don't know about dirt cake - here is the recipe!!! You can make it and then serve it in a pot like this above. It's fun to add gummy worms to it also. Chop cookies very fine in food processor. The white cream will disappear. Mix butter, cream cheese, and sugar in bowl. In a large bowl mix milk, pudding and whipped topping together. Combine pudding mixture and cream mixture together. Layer in flower pot, starting with cookies then cream mixture. Repeat layers. 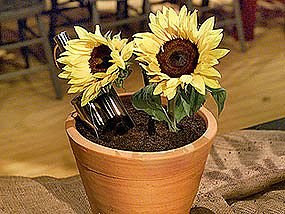 Add artificial flower and trowel. Enjoy! And tonight was my friend Hillary's birthday (want to give her a shout out!) so I went and ate dinner with her and Holly, Ashley, Katie and Shannon at Granite City Grill. So fun! I know I say this all the time but I just love girlfriends. I have the best husband but there is just something about girlfriends that you can't replace. What is your favorite thing about your girlfriends and what is your favorite thing to do with them? Thanks for my gift! And for the fun fellowship! You're the best! That looks so fun and you all look so cute! What a perfect way to spend a day! SO glad you had a great time, and all your friends are so adorable. And you are right--there's just nothing quite like time with the girls. I am still amazed at how each time I am with any of mine, I become even MORE thankful for their presence in my life. Love it! Fav thing about the gf's: how all of our personalities are different, but mesh together perfectly. Great day! OO Chicken Salad-I bet that was great! Ya'll did have fun at the Granite City Grill! YUM! Happy Birthday to Hillary! Well, to me, when I'm with my best friends, just being around them is everything to me. It doesn't matter what we do. We laugh no matter what! My best friend is of course my sister and I have a best friend in Magnolia. Haley and I talk on the phone and we still stay connected! My favorite thing about my friends is that I can totally be myself. There's no pressure to be something I'm not. I love to go on hikes with 'em, scrapbook with 'em, go out for coffee or lunch or dinner, and sometimes catch a movie! By the way Kelly...you're very tan! I have really been missing having consistent girl time. It's been a struggle for me to meet women and develop deep relationships this last year. You are very blessed to have such a strong group of girlfriends. I have a few close ones and its been that way since school days..just the very few..and I guess thats alright too! I could not live with my girlfriends! Our favorite thing to do is meet up at Starbucks after the kid's are in bed. They usually have to kick us out so they can leave then we stand outside and talk forever. Sleepovers! You are never to old to stay up late talking with friends about anything and everything! I can't pick one favorite thing that I do with my galz...especially La & Meag! We ALWAYS have fun! Road trips are making their way on the top of the list! I don't get to spend as much time as I would like with them but I love that they love me with all my flaws. I am supposed to go to lunch this week with a great friend for my birthday and then dinner and a movie with another one next week. I am looking forward to the girl time. Glad you had such a great day. btw I loved all your Hawaii trip posts. Looks like it was a WONDERFUL trip! Thanks, friend!! Have a great day! You're so right...there is just something about having a good group of girlfriends. Mine are my lifeline!! There are 6 of us and we have dubbed ourselves "Sisterchicks". (We didn't make it up. Check out sisterchicks.com). Every Christmas, we draw names to buy gifts for each other, but our gifts are always themed! It's SO much fun!! One year was color (all the gifts were certain colors), one year was room of the house (gifts that go with a certain room of the house), one year was movies (gifts that went around a certain movie) etc, etc, etc. It's one of the things I MOST look forward to each year. We also do regular girls nite out: fondue, movies, etc. Sorry this post is soooooooooooo long!! FUN FUN FUN FUN!!!!!!!!!!!!!!!!!!! oh happy birthday hillary!!!!! you girls look soooooo cute!!!!! What a fun time!! I love hanging out with the girls, it is just so much fun to hang out and talk about girl things!! Both of my two dearest girlfriends are so busy. One is a mother of 3 (Brooklyn...Check out her blog) and the other is Kristine, our Youth Pastor's Wife. It is a treat to go to dinner with them and talk about anything and everything. Kristine and I try to hit all the chick flicks because neither one of our husbands really care for them!!! I love having that special "tradition" with Kristine. I LOVE my girlfriends, even the ones I've never met ;) George tells me that I've never met a stranger, and that is so true. I went through a season once where I didn't keep up with my girlfriends, and I was miserable. I have tried really hard to stay in touch since then, especially with the ones who live far away. I just love doing life with my girlfriends. We support each other, and I don't think there is anything better than helping encourage your girlfriends. Not surprisingly, I LOVE to talk to them on the phone. Girls just "get it." I love to go to lunch/dinner and chat about anything and everything. My best friend of 17 years (Jessica) can read my facials and know EXACTLY what I am thinking. :) Oh, and shopping together is fun, too! Yay! Girlfriends are the best! I love taking girl trips with my two best girls! Or dinner and chick flick nights - so fun! I love my girlfriends too! I love that we can get together to eat and talk and talk and talk. And it's funny because we are all in different stages of life (I'm the only one without kids) and I'm the youngest, but we still have so much fun! I'm so glad that God brought us all together. I love our beach trips. We always have such a great time! Yum O is what I think about dirt cake. I cherish time spent with girlfriends. My favorite things to do with them are: shopping, going to the movies or renting a movie, ordering a pizza, & vegging out at home, scrapbooking, going to dinner..the list could go on and on! !